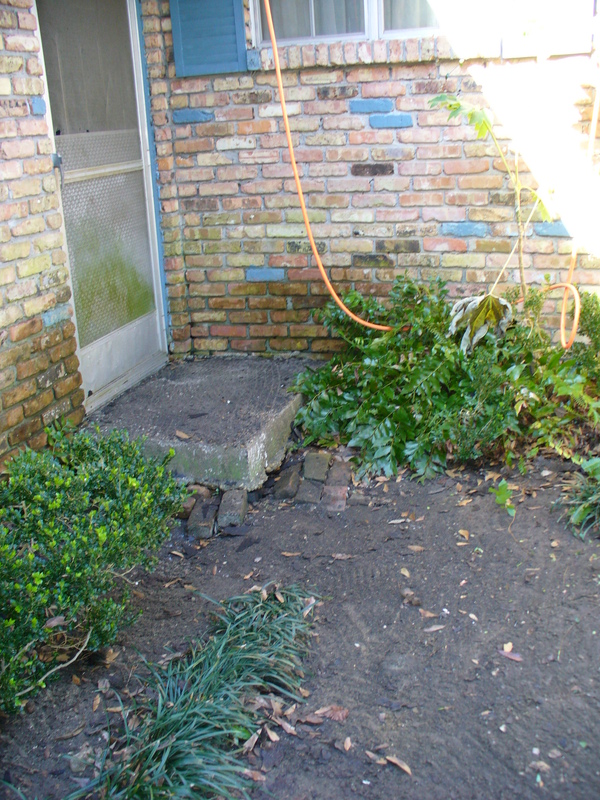 Cleaning up Miss Hattie’s yard | Where have the days gone? 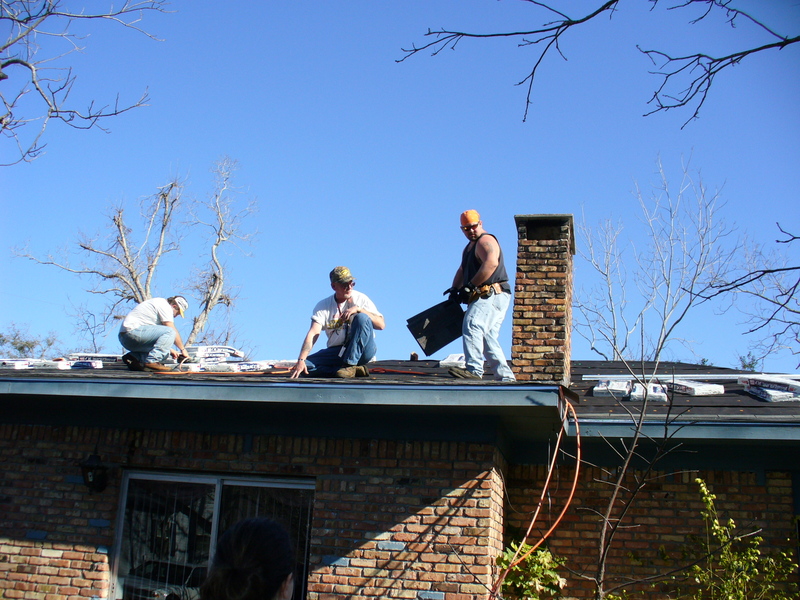 On Wednesday, Janis, Karen, Danica and I asked to be re-assigned since our part of the painting job was done, so we were told to go to the house where Rudy's Roofers were putting on a new roof, and be the ground crew. So after breakfast (creamed chipped beef on toast, not our cup of tea, so we just had oatmeal and yogurt) we said good-bye to the rest of our crew, and started hunting for the roofing crew to travel with. 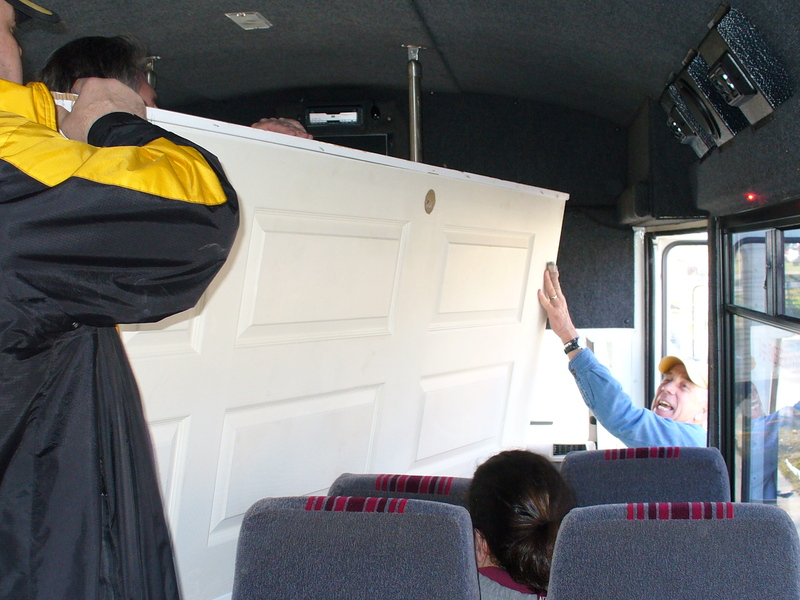 Apparently they had left earlier, so as it turned out, we still travelled on the bus with our guys and the flooring crew. It took a while to get going again because the flooring crew had to load extra things, such as a door. 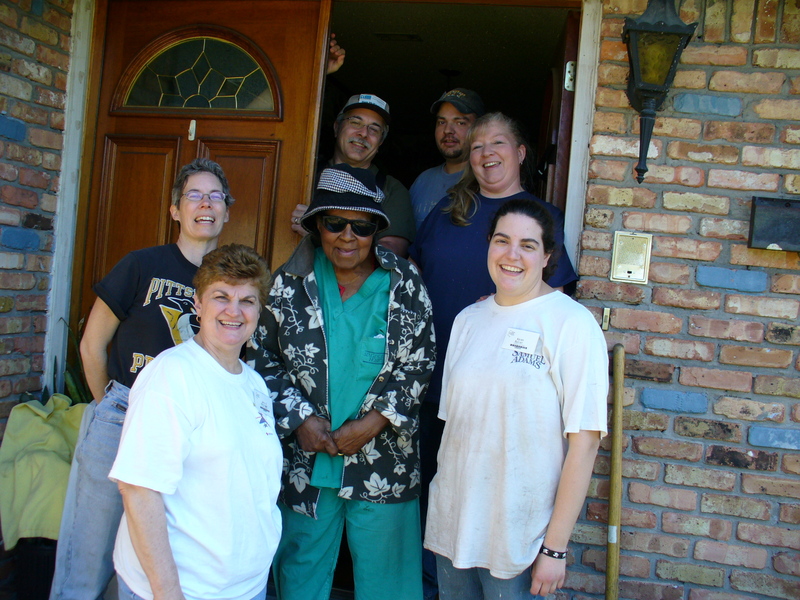 We dropped the painters off first (said good-bye again), and then the flooring crew in Moss Point, since our new project was in Moss Point as well. It took some extra turns to find the house, since the street sign was missing (actually many street signs are still missing), and a rest stop at Sonic, but eventually we got there around 10:30. 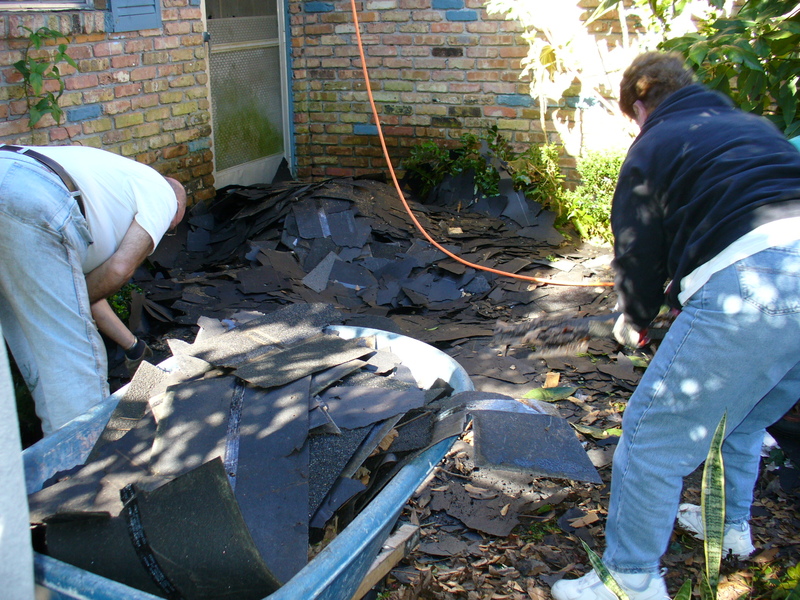 Our job was to clean up the old shingles and debris that had been thrown down from the roof the day before by the roofers. Several of the piles had already been cleaned up by their own ground crew, but they had wanted some help finishing up so their whole crew could be on the roof this day. This involved picking up the shingles, loading them into a wheelbarrow, and then pushing the wheelbarrow to the dumpster on the other side of the house. I was glad I had my gloves and hard hat (since things were often coming down from the roof). We could see that Miss Hattie, the homeowner, had put a lot of work into her flower beds, so after we cleaned up the large debris, we went through with rakes, and cleaned out all the dead leaves too. We also went over the whole yard and flower beds carefully with a magnet broom, to pick up all the roofing nails and screws (there were a lot, and also many old nails and other sharp metal objects as well). By 1:00 we had really done all we could see to do, so when Pastor Larry and Annie stopped over during their daily rounds, we asked what we should do next. He told us to come back to the camp, and he'll have found us a new assignment by the time we got there. Miss Hattie told us that she didn't have any flooding where she was, but the wind had damaged her roof. She had been happy to find out there was a group that could help her fix it finally. She had been through lots of hurricanes, but never one like that one. Even though we only did this job for a half a day, it was back-breaking work, we got sunburn (! ), and Danica got a splinter. So we were ready to go back to the camp and just gather up what we would need for the next day.